Wildfires And High Temperatures Scorch The Western U.S. : The Two-Way Hundreds of people have evacuated their homes because of fires in California, New Mexico and Arizona. A heat wave across the region is contributing to the problem — and in some cases, setting records. 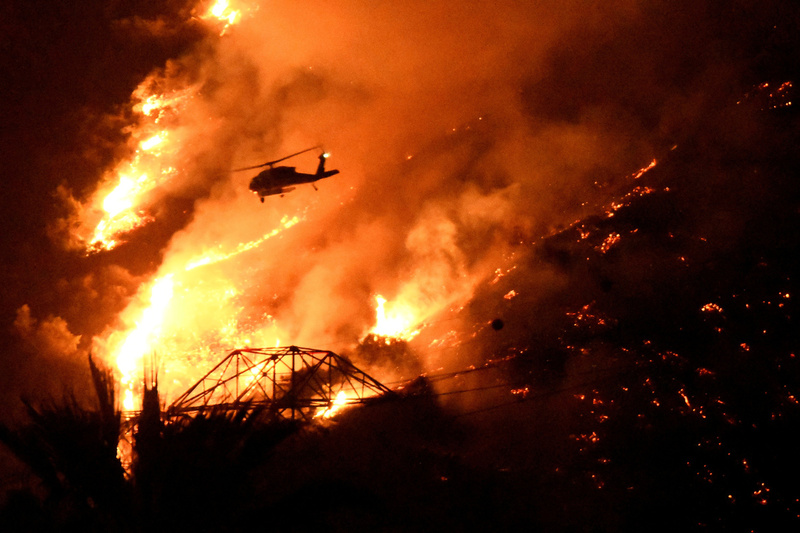 Wildfires And High Temperatures Scorch The Western U.S.
A Los Angeles County fire helicopter makes a night drop while battling the Fish Fire above Azusa, Calif., on Monday. Five years of drought, 100-plus temperatures and gusting winds: Firefighters in Southern California are facing dangerous conditions as they battle two day-old fires east of Los Angeles. And they're not alone. Wildfires are raging in several Western states as a heat wave grips the region. The Reservoir Fire and the Fish Fire in Los Angeles County, both of which started Monday, have burned thousands of acres each. More than 750 homes have been evacuated, the LA County Fire Department says. Firefighters watch a blaze in Azusa on Monday. New wildfires erupted Monday near Los Angeles and chased people from their suburban homes as an intense heat wave stretching from the West Coast to New Mexico blistered the region. The brush in the Angeles National Forest, where the fires are blazing, is "practically tinder" after years of drought, Matt Guilhem of member station KVCR tells our Newscast unit. 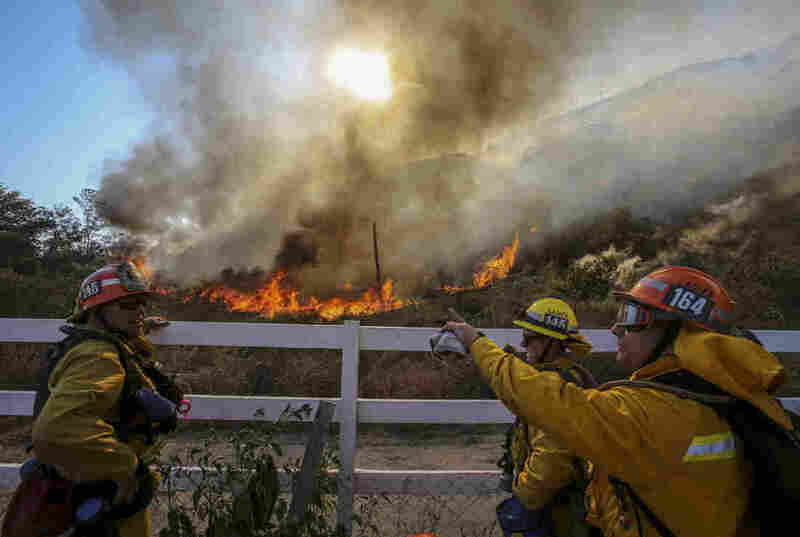 Sea-breeze gusts of 15 to 18 miles per hour are helping the fire spread, a weather forecaster tells Guilhem, while the triple-digit temperatures across Southern California (and much of the rest of the Southwest) are worsening the problem. The heat wave is also rough on the heavily laden firefighters working in steep canyons to try to control the fire, an Angeles forest spokesman tells Guilhem. As of Tuesday at 1:30 p.m. ET, the two fires were zero percent contained, the Angeles forest spokesman said. More than 600 people were working to fight the fires. 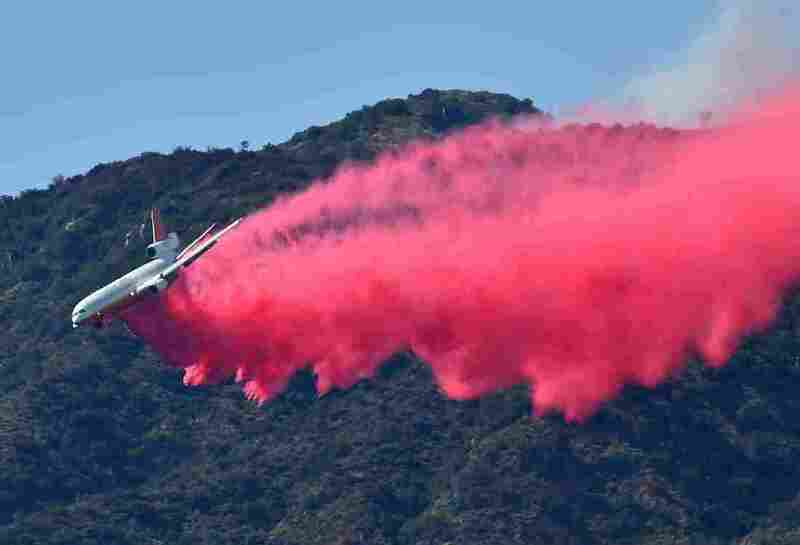 A DC-10 air tanker drops fire retardant in Duarte, Calif., on Monday. Twin fires have already scorched more than 3,500 acres and continue to burn with zero percent containment in the San Gabriel Valley, northeast of Los Angeles. The fires were moving toward the mountains, away from residential communities, The Associated Press reports. In fact, they're moving toward each other and could converge. But they could also shift direction if the wind changes, the wire service notes. Meanwhile, near Santa Barbara, Calif., firefighting crews continued to battle a wildfire that has been burning for more than a week. It's now 70 percent contained. That fire, known as the Sherpa Fire, has burned nearly 8,000 acres, or more than 12 square miles, Reuters reports. 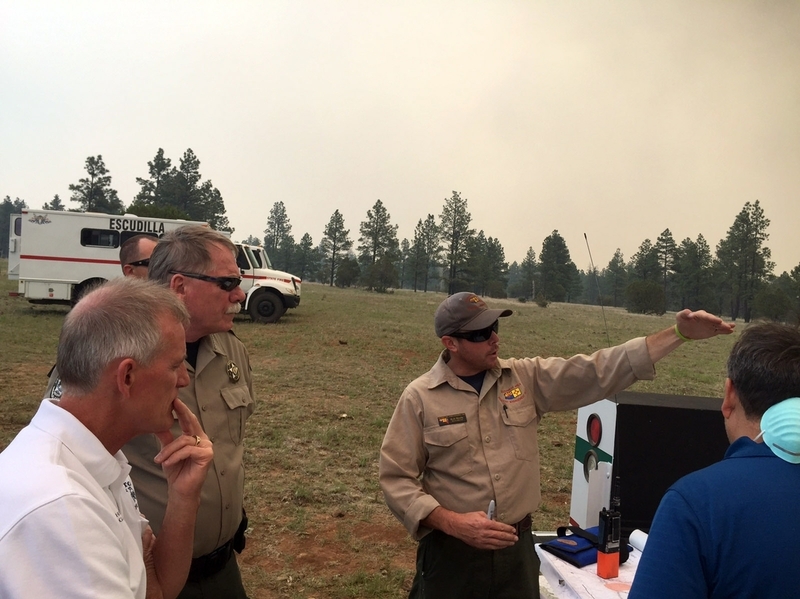 Navajo County Sheriff KC Clark (second from left) attends a wildfire briefing last week from a U.S. Forest Service official at Fort Apache Indian Reservation, Ariz. In Arizona, a fire has blackened nearly 42 square miles on the Fort Apache Indian Reservation. 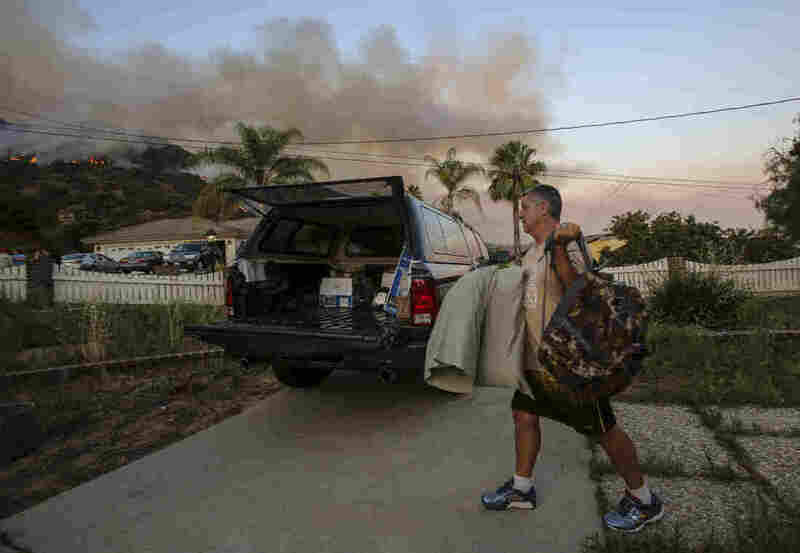 About 300 residents were being prepared to evacuate their homes, the AP writes. Sparse vegetation is helping slow the movement of that fire. "In central New Mexico, a 28-square-mile fire that erupted last week and destroyed 24 homes in the Manzano Mountains south of Albuquerque was largely uncontained," the AP reports. "Higher humidity overnight allowed crews to strengthen lines around the fire." And near the small town of Potrero, southeast of San Diego, a 7,500-acre wildfire has led to the evacuation of 75 people and heat-related injuries for three firefighters, AP reports. 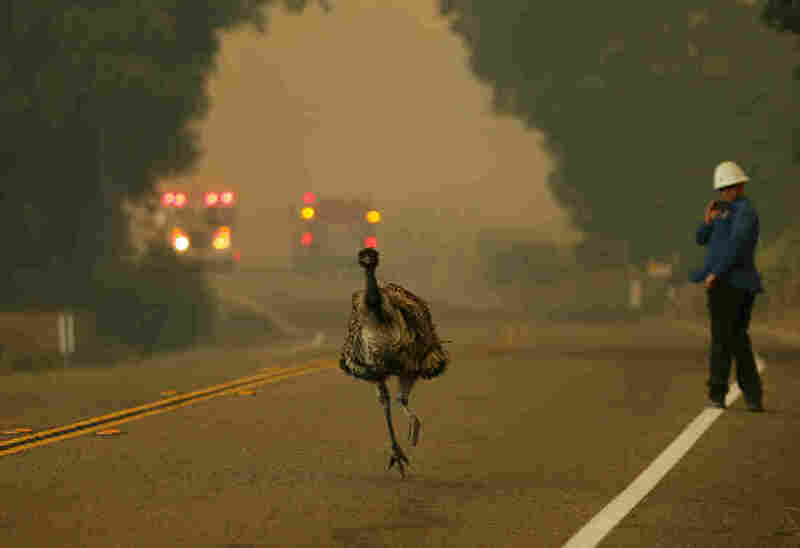 An emu runs to escape an approaching wildfire near Potrero, Calif., on Monday. That fire is 5 percent contained, according to the California Department of Forestry and Fire Protection, or Cal Fire. As for temperatures, it's a litany of torment across much of the Southwest. Today's high for the greater Los Angeles area: 107 degrees Fahrenheit, according to the National Weather Service. Las Vegas: 113 degrees. In Boulder City, Nev.: 114. In Yuma, Ariz.: 117 degrees, "with little overnight relief." Along the Colorado River in Nevada: 120. A man evacuates his home as a wildfire burns along a hillside in Duarte on Monday. Police in the city of Azusa and parts of Duarte ordered hundreds of homes evacuated. Others were under voluntary evacuations. Phoenix has set two consecutive daily heat records, with 118 degrees Sunday and 116 degrees Monday. In Palm Springs, Calif., on Monday, the temperature was 122 degrees — just one degree short of the all-time heat record for the city. Death Valley could hit 125 degrees on Tuesday, the National Weather Service says. A heat wave this intense can be deadly, the NWS notes, advising people in affected areas to drink plenty of water, avoid alcohol, caffeine and sugar and seek out air-conditioned spaces. Excessive heat is expected to continue Tuesday and Wednesday, the weather service says — and to return again next week.